I first heard about earth house construction or clay building from the great raconteur, my mother. She had two stories which painted a rather unsalutary picture. The first was a cameo about my father attaching one of those old fashioned telephones to the wall in the passage in Cape Town. After drilling through a century’s worth of wallpaper, so the story goes, there was a pop, and the drill hit dust, and when he pulled it out, like a cork from a bottle, a stream of red clay powder followed, like the sand pouring through the neck of an hour glass. He then had to fill that section of the wall with plaster to be able to bear the weight of the telephone, which at that time, would have weighed quite a lot. He never drilled into the wall again. The other story is that during the big Tulbagh earthquake of 1969, the solder, or clay fireproof ceiling on the old thatched homestead on the farm in the Karoo (desert), had just crumbled and so they had to knock the house down and build a modern house. I bought into this version of earth architecture, for two decades, though today stories like this make me want to chew my thumbs off. Regarding the old Dutch farmhouse, what a waste of history, and really, we’ve never had wallpaper in the passage of the house in Cape Town, not in living memory or historically. That mother of mine ! I’ve since worked on earth house construction, treading clay and hand plastering a hay bale meditation centre a few years ago (punishing to the hands let me tell you) and I've seen it on face book as I watched from a distance the pictures of the house that Jill built, as Jill Hogan and her Institute of Alternative Technology in McGregor slowly changed the hearts and minds of clay haters around the country (just joking, no one hates clay). But I did this because long before that, in the few years prior to 1994, my eyes were first opened, not by someone smearing them with clay, but by seeing wattle and daub clay buildings in Germany. Specifically it was a tumble down cottage and its long deceased inhabitant with which I fell desperately in love: Fuchs Friedchen’s Hauschen, which was spilling its guts to the degree that you could see all its structural elements. Fuchs Friedchen was the school children's name for the old crone who lived there and sold bits and bobs out of a suitcase, door to door, and grew her own food on a plot nearby. When you peeped in through a hole in the wall where the clay had crumbled away and only a matrix of canes remained, there was a very low ceilinged room with huge oak beams and a fireplace, and a rickety staircase disappearing into the roof. I dreamed all those decades ago of buying that house one day, but it was demolished recently. I became fascinated by these traditional German Hauses, as was my partner’s adoptive father, an architect for the Stadt Radevormwald, Volker Kloppert, who helped out with information on the various gorgeous forms of village architecture in the region, from earth houses, to slate cladded houses and stone castles. I began to read voraciously on earth architecture around this time. In Germany there are currently 2.2 million extant clay houses (Georgiev, G. et al 2014) of considerable age. There was also a spate of earth house building after WW2 during the rebuilding of the country, which had a huge shortage of accommodation at that time. Here is a bibliography of German writing on the subject. The book which fuelled my dreams of having an earth house one day, was Gernot Minke’s clay building handbook, written in German before 1994. He’s an architect, with an impressive green CV. The book was a detailed handbook on clay building with a lot of writing on structural 'materials' science. This lovely book was a treasured possession till I gave it to a potter friend of mine who wanted to start an eco commune in the Eastern Cape. Since then Gernot Minke has released a number of other books on earth building, and building with bamboo and grass which all appear to have rave reviews. These days he writes mainly in English, for example, he has written a new book on earth building in 2006, which I have not read, but looks as interesting as the old book I had, but in hard cover with sexier book design. Earth building is a labour intensive building method, if you do not make an effort to find ways of adapting modern technology to the age old technology, as they have in modern buildings in Australia, as well as in the prefabricated shells made in Mexico and exported around the world which are described in my micro homes article. They are assembled onsite and covered with earth to stabilise and insulate them in hot and very cold climates, using geothermal modulation. This factor of labour rather than its unsuitability as a material is I believe the reason for the decline in building earth houses in the 20th Century. That and the unhealthy preoccupation with the outward signs rather than the inward ethos of progress, in which sheet metal, plastics and glass (all pyrotechnologies) represent the modern, rather than ecological sensitivity. I grew up in a clay house in Cape Town, as I said. It is over 100 years old and its still standing today. Clay building is traditional in certain parts of South Africa as it is in most parts of the world, being the most common building substance in history. I will briefly point to the beauty of traditional African thatching in the article on thatch. 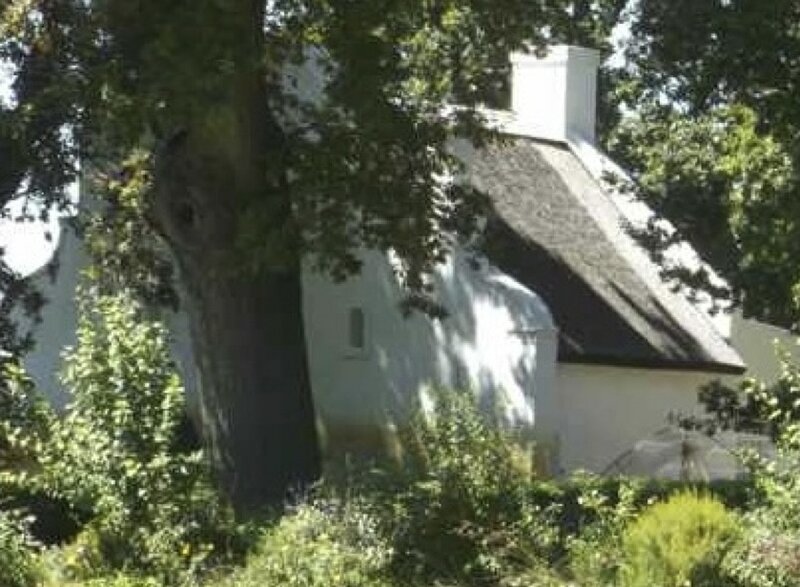 Building with clay and reeds was also the traditional ‘Cape Dutch’ way. This is how the house at Buitenverwachting would have been constructed. I love the ethos of these simple original rural buildings, before they acquired their baroque frills. Like a lot of other traditional building in Africa, they were so eco sensitive, extremely low carbon footprint micro-homes frequently built by co-operative groups of women without the help of men, meaning that no rural woman no matter her income, had to be homeless, without a door against the wild animals and a roof over her head.